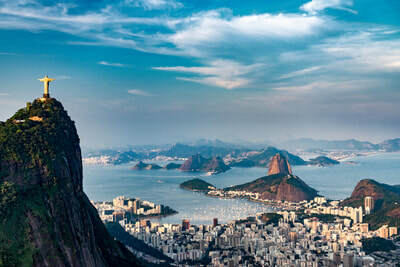 Brazil is famous for football (soccer), its annual Carnaval celebration, the world-famous cities of Rio de Janeiro and Sao Paolo, and natural wonders including the Amazon rainforest and Iguaçu Falls. Rio de Janeiro is often called the “Cidade Maravilhosa,” or the “Marvelous City” and how true it is! 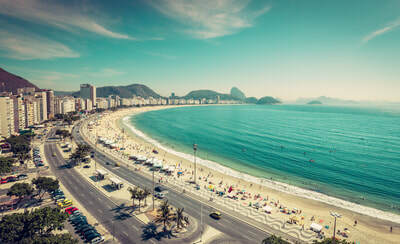 Start with the glorious beaches of Copacabana and Ipanema on the warm and fresh Atlantic Ocean. Walk the neighborhoods, drink beer with the locals, hike the famous Sugar Loaf, and enjoy the vibrant nightlife. Endless possibilities. Rio de Janeiro offers Ipanema for arts and crafts and Mercado Uruguainana, one of the city’s largest open-air marketplaces, with almost anything you could want. In Sao Paulo, visit the beloved bookstore, Livraria Cultura, or soak up some art with your shopping in the historic Centro Cultural Banco do Brasil Sao Paulo. Savory barbecued dishes, Moqueca fish stew, Feijoada black bean and sausage stew, Acai smoothies, and Brigadeiros chocolate truffles are must-tries on the long list of Brazilian culinary delights.